Hard to believe it, but Mother's Day 2016 is a mere two weeks away. Every brunch place from here to Orange County is already filling up with reservations, so what's a foodie to do? Well, I got an email from mochidoki out of NYC and they've sent over free samples of something different that they have planned for the big day. Not sure what mochi is? Mochidoki has a good explanation here. Now it's been a very long time since we've had mochi on the blog and this collection is way fancier then what you might find in the freezer aisle. Mochi is typically plain looking but they've gone and dressed these up like fancy chocolates and then put them in these understated yet effective packages. I've tried them all and I can say it's definitely a quality product. The chocolate dipping is a really nice touch both texture and flavor wise. Oh, ok, I may have broken a few of them apart in the name of science. The ice cream inside is good. I enjoyed the nice vanilla ice cream with the itty bitty chocolate chips inside. The strawberry is an enjoyable, mildly flavored ice cream. The raspberry is stronger than the strawberry and for a moment I even questioned if it might be a sorbet. With those positives noted, I will say that mochi still isn't my thing. While this is a fine example of mochi ice cream, I just can't lock in to the chewy nature of the dough, so let's bring in the backup taste testers. While my daughter shares my reservations, my wife gives a big thumbs up. Yes it's different, but the mom of the house has happily accepted the duties of finishing off the samples. New York, NY (April 5, 2016) – Mochidoki, the artisanal mochi ice cream brand that delivers indulgent treats to your doorstep, just unveiled its Mother’s Day collection, sure to warm a mother’s heart. The new 12-piece “Heart to Heart” mochi ice cream collection features three beautiful and tasty boxes of classic white chocolate-dipped mochi ice cream flavors perfect for gifting foodie moms. Moms will enjoy every bite of Mochidoki’s delicious hand-dipped mochi ice cream, including four-pieces of white-chocolate dipped Raspberry White Chocolate mochi made with creamy natural raspberry ice cream and bits of white chocolate crunch; four-pieces of decadent Strawberry mochi ice cream dipped in tie-dyed pink and white chocolate and drizzled with semi-sweet dark chocolate; and the signature Vanilla Chocolate Chip mochi ice cream molded into hearts, decorated with pink and white chocolate. Each gift set includes a personalized note card. The 12-piece gift set is available online at www.mochidoki.com for $40 plus shipping. For the most passionate mochi ice cream lovers, Mochidoki also features a collection of twelve signature flavors available in 10-piece packs, priced at $20.00 each. Mochidoki flavors range from traditional favorites like Matcha Green Tea, Black Sesame and Azuki Red Bean to modern flavors like Lychee Colada, Mandarin Orange Cream, Raspberry White Chocolate Crunch and Salted Caramel. The 10-piece packs can be purchased online HERE. Mochidoki’s premium mochi ice cream is made using the highest quality sweet rice flour that is steamed and carefully kneaded until it becomes chewy and soft “mochi.” The mochi is then carefully wrapped around gourmet ice cream for an enchanting combination of taste and texture. 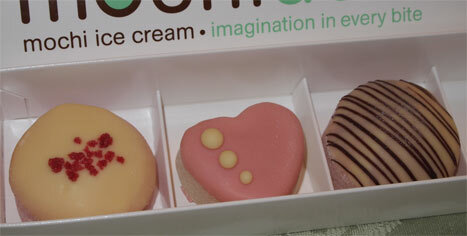 Mochidoki is made in small batches using natural ingredients, no artificial sweeteners or colors and simple ingredients. Mochidoki is also Kosher certified and offers gluten-free options. For more information or to place your Mochidoki order visit www.mochidoki.com. Mochidoki, a fresh and modern approach to a traditional Japanese dessert, was founded in 2014 by Ken Gordon, a (native) New Yorker with the dream of satisfying America’s growing appetite for mochi ice cream and innovative frozen desserts. Mochidoki’s team of talented culinary experts creates delicious mochi ice cream using natural flavors, exotic ingredients and unique textures and fillings to satisfy every adventurous sweet tooth. The gluten-free dessert is available for purchase online featuring a selection of twelve traditional and modern flavor options. Mochidoki also offers a portfolio of pre-selected Mochidoki collections, each featuring four unique flavors. Flat rate, nationwide shipping is available. Visit Mochidoki online at www.mochidoki.com, like on Facebook and follow on Twitter and Instagram. $40.00 (plus shipping)?!???!! I love my mom and all, but if I'm going to spend that kind of dough I'm going to get something more substantial than ice cream. I bought it for my Japanese mother after seeing it here. She loved it!